Many parents can tell you that colic is the absolute worst. Having a baby that’s teething, gassy, constipated or just plain unhappy is not fun — especially when you think you’ve tried everything to help soothe them and nothing works. A big part of the problem is that it can be difficult to determine what it is that your baby needs to help make him or her happy. We all know that there isn’t a magical remedy that guarantees to stop baby’s crying. However, doctors do sometimes suggest gripe water to parents saying that it can help. I’m sure you’ve heard of gripe water before since so many moms and dads swear by it. But what is gripe water exactly? Gripe water is an over-the-counter liquid supplement made to soothe colic, teething pain, hiccups, and flatulence. It was originally developed in the 1800’s by a British pharmacist named William Woodward. Woodward adapted it from a remedy to treat “fen fever”. This was fever that plagued many babies and resembled malaria in its symptoms. He discovered that the remedy also worked to effectively relieve gassy/ colicky babies — and so gripe water was born. Why Do I Recommend Wellements to My Family, Friends & Clients? Wellements is a leader in their industry with a whole line of all-natural, safe and effective infant wellness products. Along with teething oil and a constipation relief supplement, one of their products that I love is their organic gripe water. Did you know that they are the only organic gripe water on the market? (Meaning it is certified organic and preservative-free.) Many products claim to be all-natural, so look for the organic seal to ensure you are truly buying something natural. Today, they have some exciting news, which I am thrilled to share!! Wellements is now offering their NEW Organic Probiotic Gripe Water online and in stores! They are the only gripe water out there that also contains probiotics. Let me tell you a little bit why this is a GENIUS idea. Studies are showing that babies given probiotics have less stomach discomfort and shorter crying spells. Not only that, probiotics can help with colic, acid reflux, constipation and more! Experts also suggest long-term probiotic use can provide asthma, allergy and eczema relief. With all of these benefits, more parents are recognizing the long-term health advantages of starting probiotics early in life. They are now searching for safe products for their infants and toddlers. This is why I was excited when Wellements reached out to me letting us know about this great new product. It’s nice and reassuring that a company that I know and trust is now offering these two favorites in one product. As a postpartum doula, I have been asked by several of my friends and clients what I recommend for gripe water and for probiotics. Of course, I always say that they need to discuss these things with their doctor first, but now with this new release, it makes these tough questions an easy decision. The Wellements Probiotic Gripe Water is free from preservatives, alcohol, parabens, gluten, dairy, soy and artificial ingredients. 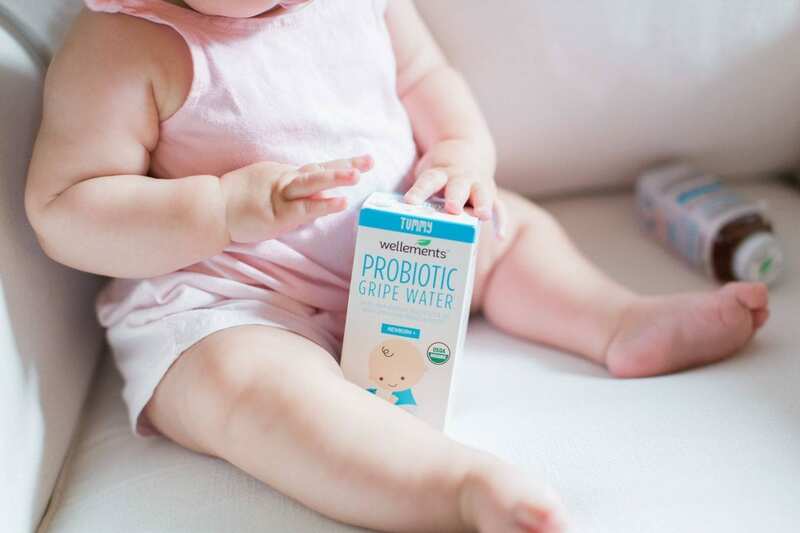 Wellements chose the probiotic strain LactoSpore™ for use in its gripe water based on the strain’s history of safety, stability and effectiveness with infants. If you’re wondering how you administer Wellements Probiotic Gripe Water, it’s easy to do. Follow the suggested dosing (located on the side of the box) and administer directly using the syringe provided with the product. Because their products do not contain chemical preservatives that you may find in other common brands, you will need to refrigerate after opening the container. They also recommend that you wash and dry the syringe thoroughly after each use. Another thing that I love about this product is that it’s safe for everyday use starting from newborn (as early as 2 weeks) – plus. As you can see in the pictures above, my sweet friend, Ashley, and her 6-month-old daughter were testing it out! Knowing that this product not only starts your baby on the right track for digestive and immune health, but that it can be used for those daily discomforts including upset tummy, gas, colic, hiccups, teething and fussiness makes it a win-win for a parents and babies! This product is now available nationwide! You can find it on the shelves of Walgreens, their website, on Amazon.com and many others. For more information about Wellements and their products including their new Organic Probiotic Gripe Water, visit their Facebook page, linked here.